SeedCare BV has a rich history which dates back to 1932, where quality and innovation have been the most important aspect of this Dutch family company that exists for over 80 years. 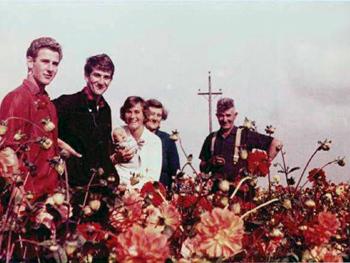 In 1932 Henk Keulen, a gardener’s son, started growing seed for seed production in Oosterleek. Including dahlia and snapdragons, but spices like salsify were part of the extensive assortment as well. All of this on a number of small lots, and with the help of his sons Nico and Joop Keulen. At the time the amount of seed production companies in the region was a lot bigger, but the Firma Keulen en Zn (the name of the company since the official ingress of Nico and Joop in 1970) was the only seed grower that produced for multiple companies. In 1962, with the construction of a simple vine greenhouse the base was made for the current glasshouse area of over 2 ha. with 20 individually adjustable departments varying in surfaces from 80 to 2000 square metre. In 1979 Firma Keulen en Zn was renamed to Keulen BV and the glasshouse construction was continued by building the first steel Venlo glasshouses under the leadership of Joop and Nico Keulen. This was the start of a busy period, wherein the entire wooden area was replaced by steel Venlo glasshouses within 5 years and in a further stage by Smieman wide-spans as well. The complete renovation was completed in 1990. Henk Keulen laid the fundament for SeedCare BV, that was established in 2000 and is now led by the third generation, Mark Keulen. Over the past years the company has developed itself further and is now equipped with modern facilities. This has made SeedCare BV a reliable and trusted part of the seed production sector. SeedCare BV is located in the Seed Valley, an area in the province North Holland between Enkhuizen and Warmenhuizen. In this area there are dozens of companies that are specialised in the breeding, production and the sales of high quality seeds and vegetable starting materials. For more information, take a look at the Seed Valley website.